Offering a branded hospital concierge app is a creative way to showcase your hospital’s facilities and services to your current and future patients. How do concierge apps work? Pop-up check-in forms, surveys, etc. Improved patient experience and brand image! Using beacons and geofencing, these features can be brought to life super-quickly and without the need for mobile app developers or expensive infrastructure. 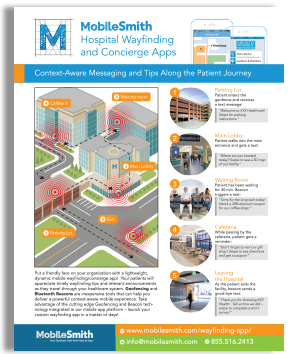 Check out our infographic to get use-case ideas for your quick, cost-effective hospital concierge app!